Set aside for a few heartbeats the vexed question of just how a minimum wage would affect employment, and focus on a more basic set of facts: What are some characteristics of U.S. workers who receive the minimum wage? The statistics here are from a short March 2014 report from the U.S. Bureau of Labor Statistics, "Characteristics of Minimum Wage Workers, 2013." Of course, the facts about who is receiving the minimum wage also reveal who will be most directly affected by any changes. How many workers are paid at or below the minimum wage? The BLS reports that 75 million American workers were paid at an hourly rate in 2013, out of about 136 million total employed workers. Of that total, 3.3 million, or about 4.3%, were paid at the minimum wage or less. 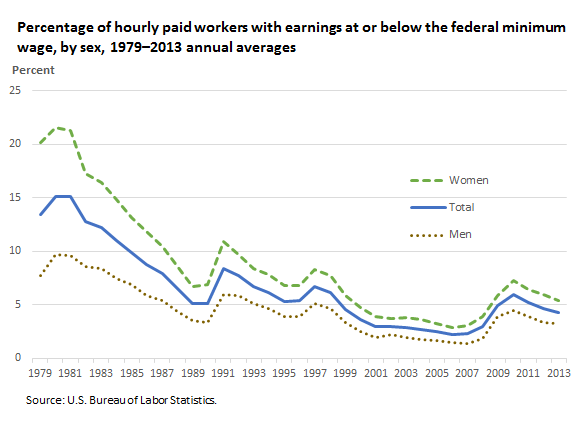 A figure from an April 3, 2014, BLS newsletter puts that level in historical context--that is, the share of hourly-paid workers receiving the federal the minimum wage is lower than in most of the 1980s and 1990s, but it is a little higher than in much of the 2000s. Of course, shifts in the the share of workers receiving the minimum wage in large part reflect changes in the level of the minimum wage. When the federal minimum wage increase signed into law by President Bush in 2007 was phased in during 2008 and 2009, more workers were then affected by the higher minimum wage. What's the breakdown of those being paid the minimum wage by age? In particular, how many are teenagers or in their early 20s? Of the 3.3 million minimum-wage workers in 2013, about one-quarter were between the ages of 16-19, another one-quarter were between the ages of 20-24, and half were over the age of 25. What's the breakdown of those being paid the minimum wage by full-time and part-time work status? Of the 3.3 million minimum-wage workers in 2013, 1.2 million were full-time, and 2.1 million were part-time--that is, roughly two-thirds of minimum-wage workers are part-time. What's the breakdown of those being paid the minimum wage across regions? For the country as a whole, remember, 4.3% of those being paid hourly wages get the minimum wage or less. If the states are divided into nine regions the share of hourly-paid workers getting the minimum wage in each region varies like this: New England, 3.3%; Middle Atlantic, 4.8%; East North Central, 4.3%, West North Central, 4.6%; South Atlantic, 5.1%; East South Central, 6.3%; West South Central, 6.3%; Mountain, 3.9%; Pacific, 1.5%. The BLS has state-by-state figures, too. There are two main reasons for the variation. Average wages can vary considerably across states, and in areas with lower wages, more workers end up with the minimum wage. In addition, 23 states have their own minimum wage that is set above the federal level. In those state, fewer workers (with exceptions often made in certain categories like food service workers who get tips) are paid below the federal minimum wage. It's an interesting political dynamic that many of those who favor a higher federal minimum wage are living in states where the minimum wage is above the federal level; in effect, they are advocating that states who have not adopted the minimum wage policy preferred in their own state be required to do so. 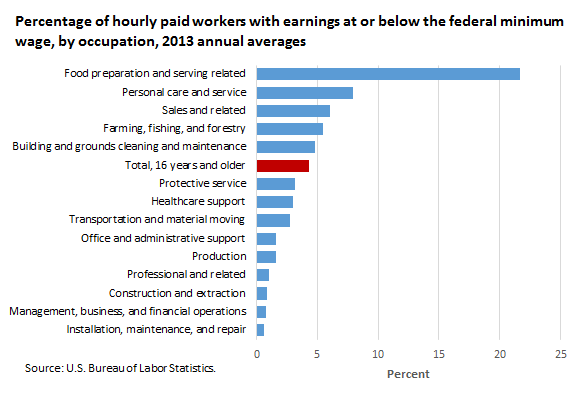 In what industries are hourly-paid workers most likely to receive the minimum wage? Whatever one's feelings about the good or bad effects of raising the minimum wage, it seems fair to say that those effects will be disproportionately felt by a relatively small share of the workforce, disproportionately young and part-time, and disproportionately in southern states.